Barbeque Ville is a North-Indian (you guessed it) barbeque speciality restaurant chain, started in Wakad last year. They recently opened a second outlet in Kalyani Nagar, to bring a taste of delicious grilled fare to patrons on this side of the city. Barbeque Ville serves an all-you-can-eat half-DIY, half-buffet style spread. Seating here is in the form of old-school booths – which we think is rather cosy, and ideal for small groups of friends. Though the primary cuisine is North Indian, you may also see a smattering of international dishes that change through the week. 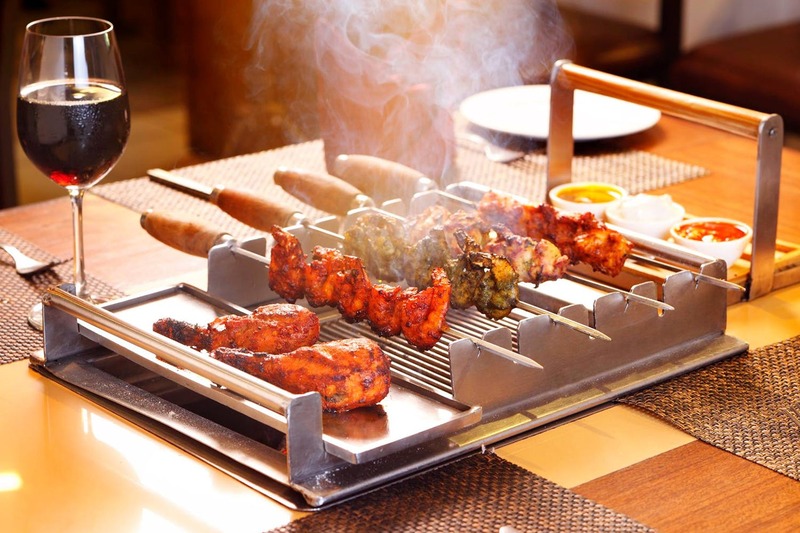 Starters in the form of tikkas and tandoori fare are served marinated and half-cooked, as you are expected to grill them (on the hot grill provided to you) yourself at the table before eating them. It isn't a novel concept, but it is a fun one. Soup, salad, chaat/street food, mains, and dessert are served buffet-style, and you're welcome to eat as much as your belly can hold. We hear their live chaat counter and dessert counter churn out especially tasty dishes. Their succulent kebabs and meaty fare are super filling, but we recommend you save some space for their fresh jalebis and rabdi! When we enquired about table bookings, they informed us they were booked up until July 31st - which we think was a bit odd. Our suggestion is if you're in the neighbourhood - drop by and see if you can score a table on-the-fly, or wait until August begins. They're currently running an inaugural 50% discount on your food bill, until July 31st.